2. Customers must register their laptops, projectors, and desktops for warranty at warranty.acer.com.ph within two weeks of purchase. present a print-out of the warranty registration confirmation with valid warranty code (the second email you will receive from Acer) and two (2) valid IDs. 4. 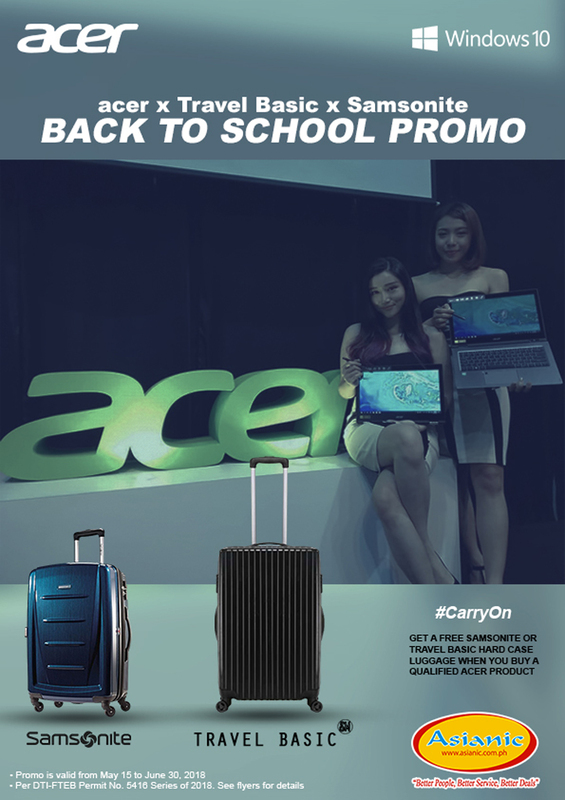 For customers outside Metro Manila, Cebu, and Davao, you may email your registration confirmation and scanned to acerph.promos@acer.com. 6. Promo is valid from May 15 to June 30, 2018. Redemption of free item is until 60 days from end of promo period. 7. Colors may vary depending on availability. 8. IMPORTANT NOTE: Promo is for end-users only. Only purchases from authorized resellers qualify for the promo. Maximum of 5 claims per customer or per company for the whole promo period. For DOA cases under this promo; refer to Annex A.